Lord God, we can seem so insignificant and unimportant. But you call us to something amazing. Open our eyes and ears to hear again the promises you make to us and keep by your grace. Amen. Mary couldn’t believe that God wanted her. She was a young girl. She wasn’t all that important. She wasn’t all that special. She wasn’t even married yet. God was holy. God was perfect in all his ways. And now he was paying attention to her!?! Now he was going to use her and her womb to save the world!?! Mary couldn’t believe that God wanted to use her. When we put our lives under the magnifying lens of God’s Word, we see how truly insignificant we are. We are just a spec in this great big universe. We are just one person in a world full of billions. Who are we that God would give his attention to us!?! It’s not just our insignificance that we see when we magnify our lives under God’s Word. We also see our sin. We’re not much different from Rahab or Matthew. We’re not much different from David. Who are we that God would give his Son for us!?! But then Mary put God under the microscope and magnified him. And she saw the marvelous things that God had done for her. He had sent a Savior for her. Through her, God was sending a Savior for the whole world. For her the Mighty One was about to break into this world to save it. Through her God was going to do great things for the whole world. God is still the same. Put him under the magnifying glass and magnify him with me. Through this virgin Mary, God broke into the world to deal with sin. Through this virgin Mary, God broke into this world with might to deal with and to defeat the Evil One. Through this virgin Mary, God brought a Savior for you, for me, for the world. Through other people, God broke into your life like the angels did on Christmas night and told you about a Savior born for you. Through other people, God broke into your life in the waters of Baptism. Through his Spirit, God has acted mightily in your life. And now, through you, as through Mary, God will break mightily into this world to do mighty and saving things. You may be just a spec in this world. Who are you to do anything in this world!?! But God wants to, is and will use you in mighty ways. You have no idea how he will use you, but because he is great, he will always do great things through you. 1. What is a magnifying glass for? What does it do for the things under it? 2. What happens to you when you put yourself and your life under the magnifying glass? 3. What happens to God when you put him, his promises and his works under the magnifying glass? Join God on his mission and tell the people in your life what Christmas is all about. Join the Mount on our mission to tell our communities about the God who came for them. 1. Read Luke 1:26-56. What do you notice about Mary’s response to the angel’s message? 2. Why do you think she so easily and readily accepts it? 3. Magnify the Lord with Mary. Write your own song of praise to the God who works mightily for you, in you and through you. 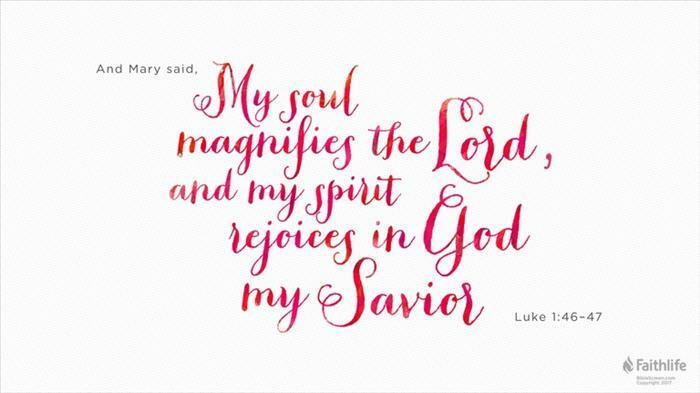 Lord God, we magnify you for your might, your grace, your faithfulness! Use us to magnify you in all we say and do so know mat more your love. Amen.